Valhalla, an energy company in Chile, is making resource assessment and solar-panel soiling measurements in advance of construction of the Cielos de Tarapacá Project. The Cielos de Tarapacá (CdT) project is composed of a 600 megawatt photovoltaic solar plant with single-axis tracking to follow the sun from east to west. The approximately 1,650 hectare (6.4 square mile) project site is located in Pintados, approximately 60 kilometers south of Iquique, in the Tarapacá Region. Cielos de Tarapacá is complementary to Espejo de Tarapacá. In 2020, the combination of these two projects will create the first large-scale system in the world capable of producing solar energy 24 hours a day, 7 days a week, competing directly and without subsidies with thermoelectric generation. Valhalla uses a CR1000-based solar resource assessment station, monitoring global horizontal irradiance, direct irradiance, diffuse irradiance, wind speed, wind direction, barometric pressure, air temperature, and relative humidity. In addition to the meteorological measurements, Valhalla also calculates a solar-panel soiling index based on short-circuit current measurements from a solar panel that is maintained clean, and one that is left to the elements. Valhalla follows best practice operations and maintenance routines on their weather stations to ensure that the data from their resource-assessment campaign is of high quality. The stations are visited weekly to ensure proper operation. 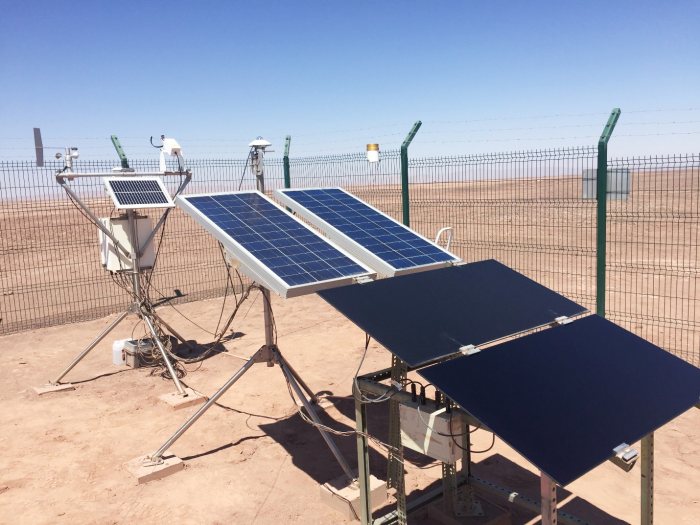 The secondary-standard thermopile pyranometers are cleaned and leveled on each visit, along with cleaning and inspection of the solar panels used in the soiling study. All instruments are maintained and calibrated per manufacturer’s recommendations.